Asthma Today is a resource for asthma patients and their families created by the American Thoracic Society. This e-booklet discusses different types of asthma and classifications, the diagnosis of asthma, asthma’s history, triggers, and treatments, and the latest asthma research presented at the ATS 2017 International Conference. Also included are tips for creating an Asthma Action Plan. The e-booklet is free to download, and health care providers and patients are encouraged to share it widely. 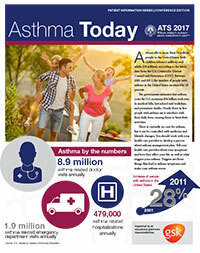 Asthma Today content was developed independently by the American Thoracic Society. Reviewers included Marianna Sockrider, MD, DrPH, a pediatric pulmonologist and the ATS associate medical editor for patient education; Maureen George, PhD, RN, E-C, FAAN, asthma expert and member of the Patient and Family Education Committee; and the Allergy, Immunology and Inflammation Planning Committee. DISCLAIMER: This e-booklet is intended for informational purposes only, with the understanding that no one should rely upon this information as the basis for medical decisions. Anyone requiring medical or other health care should consult a medical or health care professional. Any actions based on the information provided are entirely the responsibility of the user, and of any medical or other health care professionals who are involved in such actions. The American Thoracic Society (ATS) and Ascend Integrated Media have used reasonable efforts to include timely and accurate information in this e-booklet. The ATS and Ascend Integrated Media make no representations or warranties, express or implied, regarding the accuracy or completeness of the information provided herein and specifically disclaim any liability, express or implied, in connection therewith. Photos in this booklet are used for illustrative purposes only. Any person depicted in the licensed material is a model, not an actual patient or health care professional.